Young Minds Online is being trialled in by pupils in Galway, and sees them being encouraged to be “ambassadors for best practice” online. IN THE RAPIDLY developing realm of social media, who’s the best candidate to teach teenagers basic online etiquette? One media company is trialing a course that will see teenager learn everything they need to know about it — from their peers. Young Minds Online, a course developed by Media Box’s (who you might remember from The Apprentice in 2011) recently launched Digital Training Institute, transfers the responsibility of learning about topics such as handling your online reputation or digital footprint from adults to teenagers. 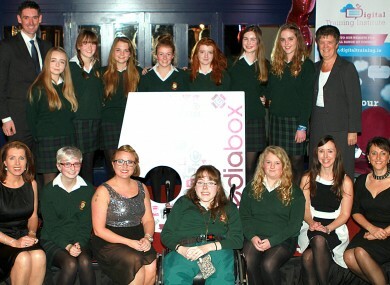 It is currently being trialled by almost fifty Transition Year students Salerno Secondary School in Salthill, Galway. Media Box MD Joanne Sweeney-Burke explained to TheJournal.ie that the idea for the course came from discussing social media with her 18 year-old daughter Sophie. She realised that while adults may have a fair idea of how the medium works, teenagers are far more involved. The course allows teenagers, under the supervision of their own teachers and Joanne, to help each other understand what steps you need to take to safeguard your privacy online, develop a social media policy booklet for their all pupils in their school as well as their parents, and also help fight online bullying. Part of this is by electing a class advocate, who can liaise with those who feel they are the subject of any kind of abuse online. They are the social media revolution. They need to lead from the front and be ambassadors for best practice. Part of this will be by creating a booklet for their parents, advising them on how to use social media, what they should be aware of, and how to stay safe on it. IT Teacher at the school Brian Fogarty said that in schools computer literary might be high, but the internet literacy might not be as high as it could be. “It’s not something you can ignore,” he said, “it’s like someone once said about the east wind — get yourself an overcoat. You can’t turn back the wind but you can prepare so it, and you can’t turn back the internet”. If this trial is a success, Media Box will look to roll out the course to other schools. The course could also provide some nationwide research in the habits of Irish teenagers online, something which Joanne says is there is a “huge lack of at the moment”. “One group of pupils will be surveying their peers with a series of questions of what they do on social media. It will be on an anonymous basis and so will hopefully receive honest answers. “If we manage to spread the course to ten other schools with a geographic spread, we can start to look at how trends across Ireland and across a different in habits between different counties. My own daughter has even noticed a difference in habits between teenagers who live in rural areas and those who live in cities”. Email “TY course leaves it up to teenagers to teach their peers about internet etiquette”. Feedback on “TY course leaves it up to teenagers to teach their peers about internet etiquette”.